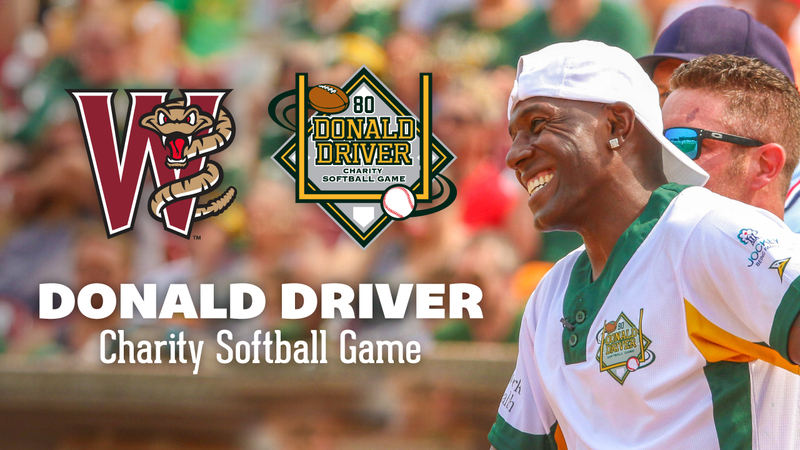 GRAND CHUTE, WI - Donald Driver is bringing his Official Alumni Charity Softball Game back to Neuroscience Group Field at Fox Cities Stadium in 2019! The Green Bay Packers All-Time Leading Receiver, Super Bowl Champion, Dancing with the Stars Champion and New York Times Best-Selling Author will host his game on Saturday, July 27. Game time is 1:05pm. Fans attending the game will receive a complimentary, limited edition Donald Driver bobblehead! "This year's softball game will be my best one yet! Free bobbleheads, more Packers, more fan engagement and more fun, said Driver. "Thank you to the loyal fans that come out and support this game, much love and see you all soon!" "The Donald Driver Charity Softball Game is the highlight of our partnership with Donald," said Penny Ransom, the Chief Administrative Officer of Network Health. "It's a fun-filled afternoon for families from around the state and ties directly to our Mission to create healthy and strong Wisconsin communities." Past participants have included Packers Super Bowl Champions Dorsey Levens, James Jones, Nick Collins, Jermichael Finley, Brady Poppinga and Jarrett Bush, five-time Olympic Gold Medal Winner Bonnie Blair, wounded warrior and Dancing with the Stars sensation Noah Galloway. Antwaan Randle El, Steve Novak, NBC Celebrity Trainer Jen Widerstrom, Ruvell Martin, Gavin DeGraw and multiple Wisconsin Badgers Legends have also participated in past games. Tickets for the softball game are $53 for a front row box seat, $43 for a standard box seat, $25 for a reserved bleacher seat and $12 for a general admission grass seat. There are also a limited number of patio tables - which seat four - available at $212. The patio tables will include one autographed item signed by Donald Driver. Fans may begin to purchase tickets for the Donald Driver Game at 10:00am on Tuesday, November 20. If you are a Network Health member, you may purchase tickets starting at 10:00am on Monday, November 19. The pre-sale for Network Health members will end at 5:00pm on November 19.